Requirements: USB device for recording (e.g., iPod video, USB flash drive, USB hard drive, etc.). Mac OS X 10.4 and iTunes 5.2 required for computer sync and/or iRecord Desktop software. Universal. The iRecord Pro hardware is a sleeker-looking box than its predecessor. Two years ago, ATPM went for a spin with the iRecord, a small simple box that encoded analog video input into H.264 and saved the resulting files to an iPod or to a USB hard drive or flash drive. This year, a second-generation recorder, the iRecord Pro, was released, and it’s time to see if this successor measures up to the original. Just like the original iRecord, the iRecord Pro features very simple one-touch recording. But, in addition to this simplicity, the iRecord Pro now allows timed recordings. Repeated clicks of the record button will set the device to stop recording after 30, 60, 120, or 180 minutes, respectively. These recording times are clearly indicated on the front of the device. Perhaps the best new feature is the iRecord Pro’s ability to save larger resolution videos. The exact size and encoding bit rate are predetermined depending on which storage device is attached, but these settings can be manually chosen using the new iRecord Desktop software. More on that, later. A remote control is also bundled with the iRecord Pro. There are two things I liked a lot about the remote. First, it includes a secondary record button to initiate an audio-only (192Kbps, MP3 format) recording. Without this, the only way to record an MP3 file is to unplug all the video cables from the back of the iRecord Pro and leave only the audio cables attached. Second, the remote allows recordings to be paused and continued without creating a new recording file. I found at least one scenario, however, that could be problematic when using the remote. The iRecord Pro automatically shuts off after a period of time if nothing is being recorded. Even though there is a power button on the remote, I couldn’t leave the device turned on and ready to record in an instant if I’m sitting on my sofa with the remote nearby. It takes a moment to power up the iRecord Pro and recognize the recording device. Depending on the environment in which the iRecord Pro is used, there could be a significant problem involving the device’s noisy cooling fan. The original iRecord had no fan at all. The presence of a fan in the iRecord Pro would suggest that encoding the larger video files resulted in a considerable amount of heat from the circuitry, and a fan was included to address this problem. There are, however, quieter fans of this size that should’ve been used. I may have implied only two years ago that a USB flash drive or hard drive is the better choice for pairing with the iRecord. This time, the same is true, and I won’t just make a suggestion to that effect. Besides gaining access to full D1 size (720 × 480 at 2.5 Mbps encoding) recordings, as well as the typically increased storage space, a hard drive or flash drive does not carry the stigma that Apple seems to have about anything other than iTunes trying to work with an iPod or iPhone. Virtually everything I described in the original iRecord review about the caveats of recording through the device to an iPod is essentially the same with the iRecord Pro. The iPod is automatically switched to manual sync mode because iTunes will otherwise want to erase media that it doesn’t have in its own library. Anyone who read the original iRecord review might remember the grief I encountered because I was not on the very latest version of iTunes—not that 7.0 and 7.0.1 were unsupported, but that a bug (fixed in 7.0.2) caused iTunes to freeze every time I plugged in my iPod after recording something with the iRecord. This time around, though iTunes didn’t crash, my iPod may as well have. My first attempt at recording to a 5G iPod resulted in a quickly flashing red LED on the iRecord Pro. According to the troubleshooting guide, the best answer was that I needed to update the firmware. When I attempted to do this, I was informed that the device was already up to date. I took the iRecord Pro back to try recording again. This time, the recording appeared to go smoothly, until I tried retrieving the recording. With the external disk mode already activated for my iPod, I found the MP4 files and copied them to my computer (samples are below). After doing so, I wanted to put my iPod back into auto-sync mode, knowing full well that iTunes would want to remove the parasitic iRecord files. That’s when I noticed in the iTunes sync window that the status bar claimed my iPod was full of “other” files instead of the usual breakdown of music, videos, etc. When I attempted to sync, only the remaining 13 GB were seen by iTunes as available space, and it asked me if I wanted to let it auto-generate a playlist to sync. Long story short, I had to do a full restore of my iPod and, as I wrote this article, my iPod was in the midst of fully re-synchronizing all of my media. Thankfully, the sample recording to my iPhone was far less traumatic, but it still came with a caveat. Unlike the iPod, I was able to watch a video on my iPhone immediately after the recording was completed. However, due to the iPhone not supporting external disk mode, I found absolutely no way to retrieve the video to my computer. As expected, as soon as I restored auto sync to my iPhone, the recorded video disappeared. The iRecord Pro also supports other portable media devices as recording destinations: Sony PSP, Video Walkman, Creative Zen Vision, Toshiba Gigabeat S, and Sandisk Sansa. I personally do not have access to any of these devices and, as such, cannot test them. Streaming Networks made a wise adjustment to the splash screen that appears for a couple of seconds at the beginning of each recording. Instead of a large graphic covering the center of the video, it’s now a small, slightly translucent graphic bug that peeks up from the lower left corner. A similar graphic appears in the bottom right corner at the end of the recording, but it’s equally unobtrusive. As stated earlier, when recording to a USB thumb drive or hard drive, the resulting video is a full-size D1 ratio (720 × 480) at a high quality 2.5 Mbps. On an iPod, the files are 640 × 480 at 1.5 Mbps. Other devices, including iPhones, are either 480 × 320 or 480 × 272 at 1 Mbps. 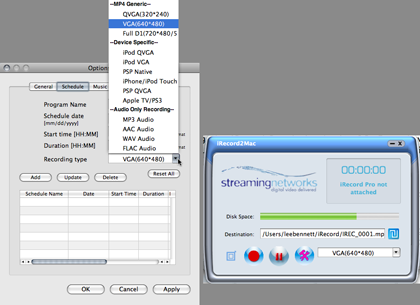 The iRecord Desktop software also allows defining 320 × 240 videos at 768Kbps when recording through the iRecord Pro directly to a computer. A short clip from a PBS station was the source of these two short samples: one recorded to a USB flash drive (12.6 MB) and another to an iPod (8.9 MB). Recordings made to other devices or through the iRecord Desktop software are of similar quality at their respective sizes. I felt the gamma levels of these recordings were a bit on the dark side. This is especially disappointing considering that the lower resolution recordings from the original iRecord were brighter. In addition, the audio levels seem softer. This might be a good thing so as to reduce the chance of audio-peaking distortion, but I had to turn my computer volume to maximum to get what I felt was a listenable level for the sample recordings (above). Had I only been reviewing the iRecord Pro device by itself, I may have been inclined to match the original iRecord’s rating of Very Nice. But this review covers the device as well as the software, and I had to consider both for the rating. In a word, the software is disappointing. With the exception of being able to schedule recordings, record video in other sizes, or record audio in other formats, I’d sooner just attach an external hard drive to the iRecord Pro than use the software interface. iRecord Desktop software’s interface for setting up a scheduled recording. A featured touted for the iRecord Pro is the ability to transcode MPEG-2 video (such as .VOB files from DVDs) to .MP4 videos. The interface for MPEG-2 video transcoding. While the conversion on my sample file was very fast on my 2.2 GHz MacBook Pro and the video quality was acceptable, the resulting MP4 file was unusable because the audio was out of sync. As with its cousin, the iRecord Pro remains probably the simplest of all the devices in this category, especially when using only the device and staying away from the clumsy software. Whether or not the additional $60 is a worthwhile premium for the higher-quality recordings and ability to schedule recordings with the software is a tough call—one that is made no simpler when considering the fan noise and the iPod/iTunes sync caveats. Copyright © 2008 Lee Bennett, lbennett@atpm.com. Reviewing in ATPM is open to anyone. If you’re interested, write to us at reviews@atpm.com. Here's a little something I failed to mention in this review—the power cord is only three feet long. As far as I'm concerned, any piece of electronics should include a minimum of six feet for a power cable. Seems to me (new owner of an irecord pro) that the ipod problems aren't as insurmountable as your review describes, and that RTFM would have helped. (Available as PDFs.) One should copy from stick/drive/ipod to PC, import to itunes, then copy to ipod. OK, clumsy, but no more sync problems. Andrews - Yes, you're correct, and I covered this in the original iRecord review. My position is that there are a number of ways to acquire a recording and keep it, such as recording to a memory stick, or recording to an iPod or iPhone. You say the "solution" is to record to a USB memory device and then transfer. That, in fact, is not a solution, but rather accomplishing the task via a different means. It still does not "solve" that recording directly to iPods and iPhones is problematic. Hi, I am considering buying this device to use to record my mothers record collection onto an ipod or similar device and giving her collection back to her. My questions; 1) is it simple enough for a non-techy person like myself to use? 2) Being these are records, I am bound to come across some songs that are so scratched or skip they can't be recorded. Can you back up and edit out material? 3) How much memory would you need for about 165 LP albums? Hi Dana. Admittedly, I've never done a project of digitizing LPs so I may not have the best information. However, I feel a device like this is probably overkill for just audio recording. In fact, unless I'm mistaken, I don't see why you couldn't just run the sound directly into the line input on a Macintosh and record using Garage Band. As for the scratches, you wouldn't want to edit out a pop sound because you might lose some of the desired content. Rather, your goal would be to filter out the noises. You'll have to do some software searching for that sort of thing. The only one I'm familiar with is CD Spin Doctor that is (or at least it used to be, not sure now) bundled with Toast Titanium. It's also available from Roxio as a standalone product. Finally, as for space for the albums (and I believe you mean how much hard drive space, not memory), the amount of space required would entirely depend on the length of all your LPs. CD-quality stereo digital audio is approximately 10 megabytes per minute. Supposing your LPs were packed full of content and were the 12-inch size LPs. Those hold 26 minutes per side, or 52 minutes per LP. Multiply that by 165 and that 8,580 minutes. Then multiply that by 10 and you're at 85,800 megabytes, which is approximately 85 gigabytes, or a little less, depending on whether you use the 1,000-byte or 1,024-byte method of calculation. Of course, if you record directly to MP3 or AAC and don't wish to keep the uncompressed original audio files, MP3 or AAC on average are about 1 megabyte per minute, so now you're only at 8 and a half gigabytes. And also remember that this assumes all 165 LPs are solid full of music. It's probably a safe bet that most of them contain less than 52 total minutes of content. Is the iRecord Pro capable of converting my old VHS tapes into a digital, editable format? Tam - that is *exactly* what it is capable of doing. Admittedly, for editing, I'd personally shop for something that recorded in a format that wasn't as compressed, such as full DV codec, but for most people, the iRecord Pro is perfectly fine with it's MPEG-4 files. You simply take the output from your VCR and attach it to the input of the iRecord Pro. Well, more accurately, you'll want some way of the signal going two places, because there's no output on the iRecord Pro to continue on to a television so you can see what you're doing. You could just use the VCR's RF output to a television and the RCA a/v jacks to the iRecord Pro. The MP4 files that are saved by the iRecord Pro can be taken into iMovie or Final Cut for editing.